Q. First of all, tell us a little about your resin figurine art at We Become Monsters and how you got into the field. I just sort of started doing it a couple years ago. At first, I customized a few existing toys, but since I usually sculpted completely over the prior toy, I figured I should just start making my own from scratch. The techniques I picked up quickly as I had previously done prop and FX work; at a basic level, making a mold is making a mold. Q. Are there any specific movies or monsters that particularly inspire your work? I’m not sure they all really show in the work, but everything John Carpenter has ever touched, even the bad stuff. Pushead’s 2D and toy work. Secret Base. Paul Rubens. Q. Who is your favorite fellow horror lover (writer, director, etc.)? 3am, middle of casting a new project. Second pot of coffee. Demons 2 playing as background. I just sort of cruise along in a dreamland, then when I wake up there are 30 more monsters in the studio. I love that. Q. What is an average workday like for you? Go to the day job for 9 hours, come home. Walk dogs. Eat. Work on art as long as I can. Sleep, repeat. Weekends would be cramming in as much artwork as possible. Q. If you’re being attacked by a masked killer, would you run upstairs, into the basement, or outside to the woods? Why? Basement – likely weapon source, likely single entrance. Supernatural killer, a la Jason? I’d be fucked, but woods, because you have to keep moving in that case. But a human dude? Basement. Q. Can you recommend any good books to us? Q. We’re big fans of The War of Art, too. Anything else you want to talk about that I failed to mention? 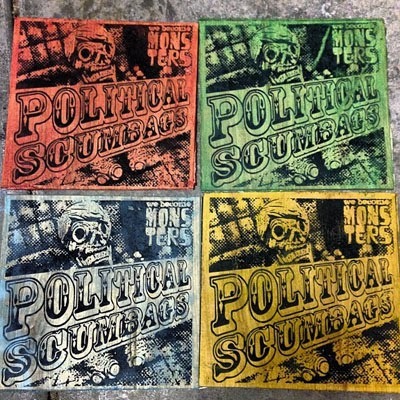 Political Nightmare Scumbags just came out! 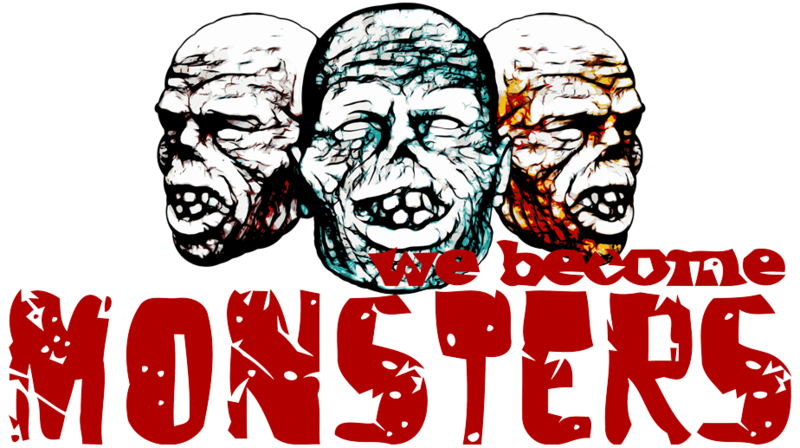 Keep up with Chris Moore and We Become Monsters by following them on Facebook or Twitter (@webecomemonster). Shop for Chris’s monsters at WeBecomeMonsters.com. 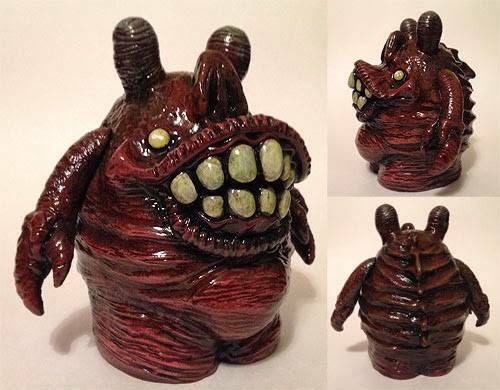 monster art, resin figures, toy, We Become Monsters.